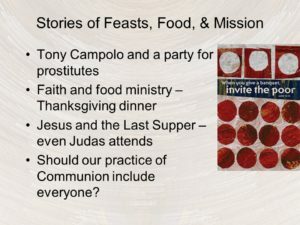 Have you ever noticed how food and feasting are a big deal in the Bible’s story of redemption? Jews celebrate liberation from Egypt with the Passover meal. Many of their 613 commandments deal with dietary restrictions. 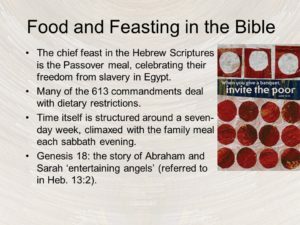 Time itself, for the Hebrew people, is structured around a seven-day week that ends each week with the family meal on sabbath eve. When it says in our Second Lesson today, “Do not neglect to show hospitality to strangers, for by doing that some have entertained angels without knowing it,” it probably is referring to the beginning of the Bible in Genesis 18. Three strangers wander into the place where Abraham and Sarah are camped, and Abraham invites them to dine with them. It turns out to be three angels, bearing a message to confirm God promises of salvation — namely, the beginning of a family to this aged couple. Sarah laughed, but their family would be a blessing to all the families of the earth. Someday, because of God choosing Abraham and Sarah to start God’s family, all the families of the earth would be able to feast together as one human family. That’s the goal, right from the very beginning. With Jesus, you have the means to that goal coming true, one human family. So food and dining become even more prominent. 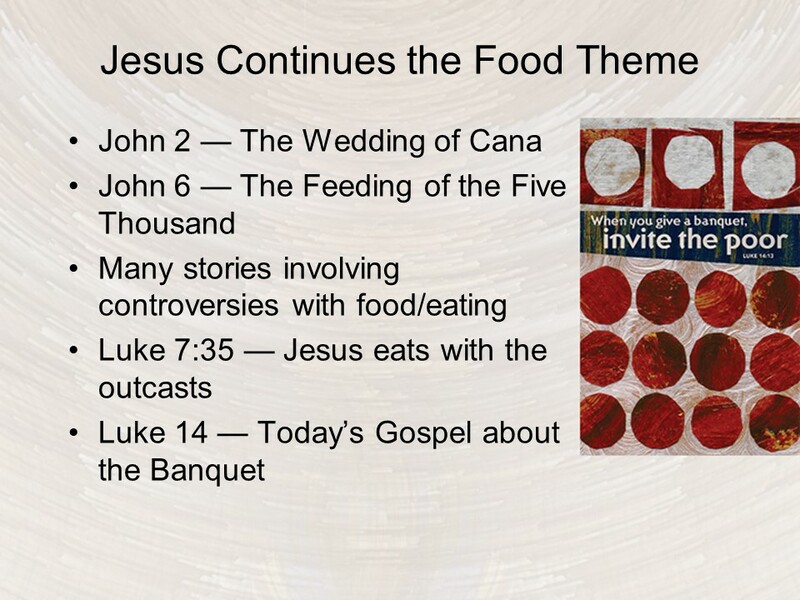 In John’s Gospel, Jesus’s first miracle was to turn water to wine at a wedding party at Cana of Galilee, the first sign of his mission. There are multiple stories about feeding the multitudes — both in Jewish territory but also shockingly among Gentiles. 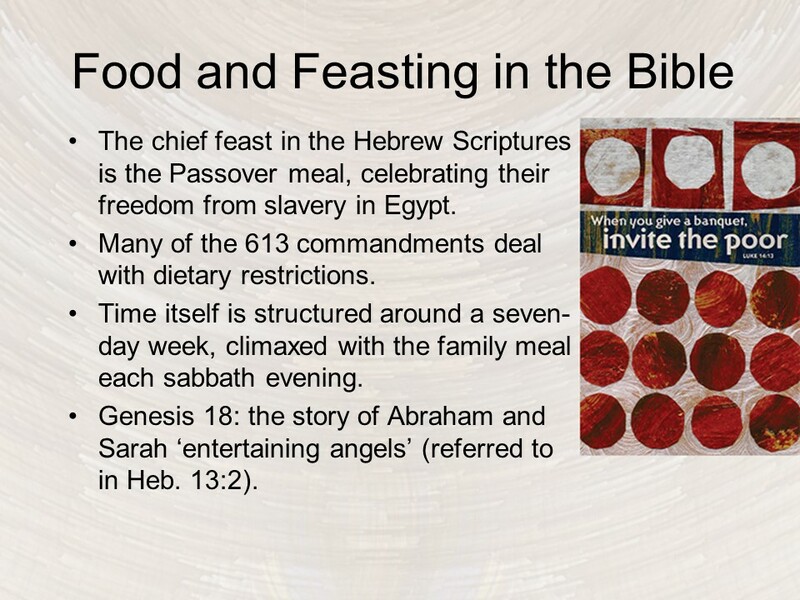 It was not kosher for Jews to eat with Gentiles under any circumstances, much less out in the middle of nowhere. 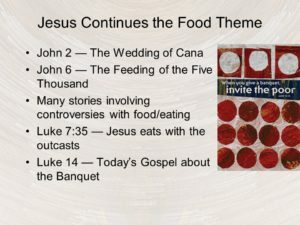 In general, the Pharisees thought Jesus quite unkosher, arguing with him about eating with dirty utensils, which foods are ritually clean or unclean (kosher) and why, and whether a Christian could eat meat that had been sacrificed to pagan idols and then afterwards sold in the market. It was true. Sometimes Jesus ate with the fringe crowd, the riffraff, so much so that his detractors disparaged him as a glutton and a drunkard (Luke 7:34). For the religiously zealous and scrupulous person of that day, to eat with a “dirty” person defiled you and made you impure. But Jesus also ate with these same religiously scrupulous and socially powerful people, and that’s where the Gospel for this week finds Him. He was eating dinner with a prominent Pharisee when he noticed something about the guests and something about the hosts (Luke 14:1, 7–14). He took the occasion to teach about vying for first place. And then, even more importantly, he teaches them about who is welcome at God’s table, namely, those who usually come last in our human way of according honor and privilege. When they left, Tony got an idea. He asked the shop owner if Agnes came in every night, and when he replied in the affirmative, Tony invited him into a surprise party conspiracy. The shop owner’s wife even got involved. Together they arranged for a cake, candles, and typical party decorations for Agnes, who was, to Tony, a complete stranger. The next night when she came in, they shouted, “Surprise!” — and Agnes couldn’t believe her eyes. The doughnut shop patrons sang, and she began to cry so hard she could barely blow out the candles. When the time came to cut the cake, she asked if they’d mind if she didn’t cut it, if she could bring it home — just to keep it for a while and savor the moment. So she left, carrying her cake like a treasure. What about Saginaw Township in Michigan? You have a FunFest in two weeks, open to everyone in your neighborhood. You participate each month in the Metro Ministries Food Pantry. I hear that the dinner you host on Thanksgiving Day is for anyone in need of coming to a holiday dinner. You take time out from your own family celebrations to expand your family to those in need in this community. That’s what we’re talking about. People might join a church like that. Let’s close with the most important meal of all, the Lord’s Supper. It is hard for us to appreciate how revolutionary this practice was when disciples of Jesus followed our Lord’s command to, “Do this in remembrance of me.” We now know that everywhere we find remains of human communities we find evidence of ritual blood sacrifice. But the latter is so foreign and distant to us that we don’t realize that the Lord’s Supper is a revolutionary replacement of the practice. The heart and soul of religion everywhere was to kill something on an altar, and as such it was also the center of their staying together as a community. They kept peace and “communion” as a family, as a community, by sacrificing a living creature on an altar. 1. 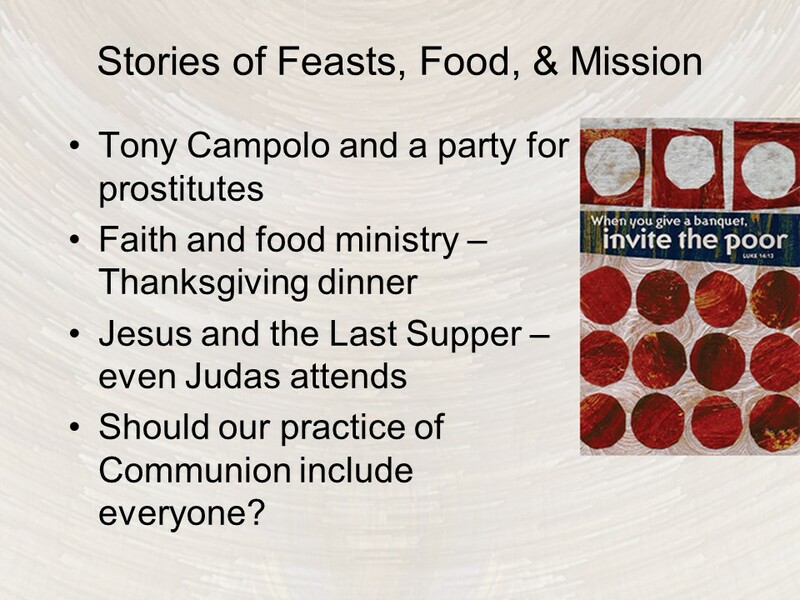 This version of Tony Campolo’s story is as told by Brian McLaren in The Secret Message of Jesus: Uncovering the Truth that Could Change Everything (Thomas Nelson, 2006), pages 145-46.